RT’s juicy analyses of works from Schoenberg’s earliest period of “emancipated dissonance” are focused and compelling in their own right, but best of all – as Mark mentioned in a recent point – they challenge a certain oversimplified historiographical narrative that most of us, at one point or another, were inculcated with, namely that Schoenberg represents a clean and historically (or should I say “historicistically”) necessary break with tonality. Schoenberg’s music is “difficult to understand,” but not because his syntax is from Mars; rather, it’s the same thing we’ve been dealing with for a while now (motivic saturation) only pushed into overdrive. Because RT doesn’t concern himself with proving Schoenberg’s place as the tradition-destroyer (rather the contrary), we are left to focus on other often neglected elements of Schoenberg’s music, such as the fact that functional equality between the notes represented for the composer a musical portrayal of an explicitly spiritual notion of Oneness. How does one really assess the perceived “difficulty” of Schoenberg’s music? Most writers – RT among them – focus on the way the composer manipulated pitch. This is understandable considering the notoriously meticulous and mathematical processes Schoenberg developed to structure pitch relationships. However, it seems that there are other factors that play just as prominent a role in the general perception of him as a “difficult” composer, factors that aren’t frequently mentioned in discussions of this “atonal” music. I’m thinking particularly of Schoenberg’s rhythmic sensibilities. Leonard Meyer talked about one of the major challenges in the reception of avant-garde music being a general lack of “motor empathy” in listeners. If we can’t feel the temporal ordering of the music, if rhythm fails to corral our motor energies and implant in us an understandable and physically identifiable model of movement, it’s hard to really empathize with it. Schoenberg aimed to dislocate and confound in the pieces analyzed here; indeed, it seems that he actively wanted to alienate, and rhythm worked toward this goal just as much as pitch. But modernism is not synonymous with affronts to “motor empathy,” of course. Berg understood this well. So did Bartók, the next major non-second-Viennesese composer we meet in these pages. While getting into some gnarly harmonic territory in his music, rarely does the Hungarian venture into the sort of non-intuitive, jarring rhythmic world so typically of mature Schoenberg. Rhythm in Bartók can be very difficult, but it’s rarely “difficult.” This is one of the many factors that accounts for Bartók’s relative popularity in concert halls (I just saw Salonen conduct Bluebeard at Disney Hall a few months ago, in fact). His music is a lot easier to feel. It’s been way too long; come check out the newest version of the must-reads list, complete with a random smattering of ten delicious new music scholarship offerings. Kudos to Elaine Fine, who, like lightning, identified our new header image. 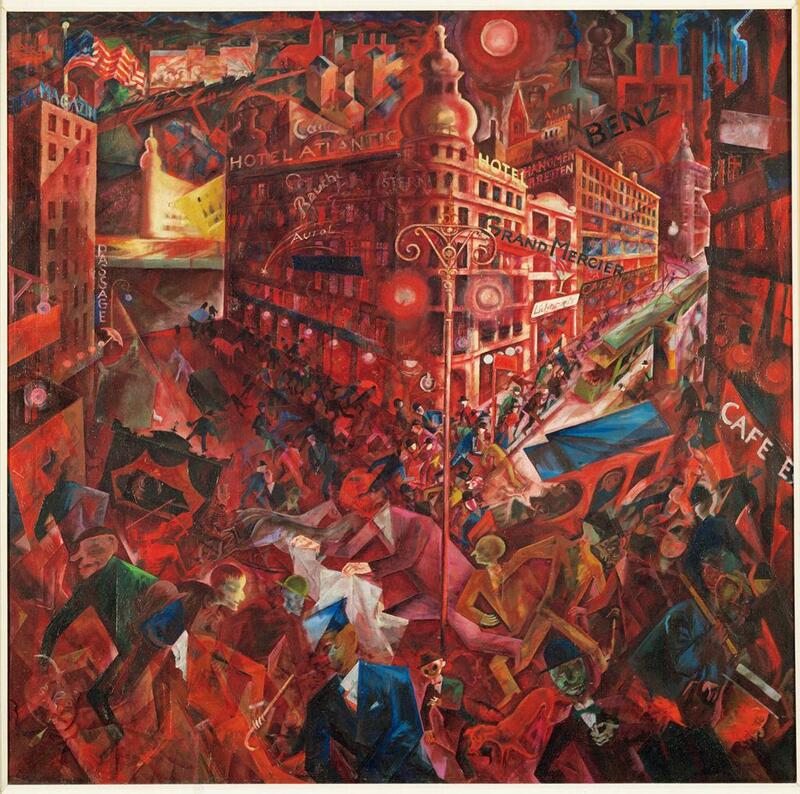 It’s a detail from Georg Grosz’s “Metropolis” (Berlin, 1916-1917). Would anyone care to guess/identify the source painting of our new header image? Artist, date, style? Anyone who does will get front-page kudos! The question of how to slice and dice the history of western music into a narrative that is stylistically coherent, historiographically intelligible, aesthetically prepossessing, and ideologically “usable” is, of course, a perennial concern to those working in a discipline whose job it is (in part) to define such a narrative. As Mark just pointed out in his last point, the conventional wisdom regarding the flow of music history more often than not centers itself around the technical, particularly how technical means get more and more complex with time. This teleological strain of music historiography has dominated the field for most of its history (for more, see Allen’s singular Philosophy of Music History, particularly the section on “organicism” [in Must-Reads]), giving us the familiar “chunks” that all of us learn in undergraduate history sequences today (Middle Ages, Renaissance, Baroque, Classical, etc.). One of the things I’ve found most refreshing about Taruskin’s telling of music history so far is his willingness to confound the standard historical periodization, eschewing the purely chronological and the purely technical in favor of developing parallel, alternative narratives based on a range of considerations that fall outside of the details of the musical texts themselves, including philosophical preoccupations (aesthetics, philosophy of history), political ideologies (nationalism), economics (commodification of music), sociological aspects (sacralization of the arts, etc), and more. This is especially true of Volume IV, where the first half is devoted to developing two new categories of thinking about early twentieth century music that fall outside of the standard account: maximalism and transcendentalism. Since we were running out of steam a couple months ago and didn’t post nearly as much as I had hoped to on the likes of Stravinsky, Ives, Scriabin, and Messiaen, it’s worth taking a moment to return to these central organizing categories now. Maximalism is an interesting and revealing interpretive window through which to view Mahler, Strauss, early Stravinsky (“aristocratic maximalism”) and the like, for it implies a certain liminal element, a striving for extremes of expression and the outer boundaries of the stylistic code. True, this category fits more comfortably within what we understand as “Romantic,” while at the same time portending its dissolution. Like mannerism, however, maximalism is liminal both in its propensity to embrace the extremes and also, in a more Turnerian sense, in its transitional function. Indeed, the ends of one style very easily blurs into the beginnings of another. Transcendentalism likewise plays with a certain limit concept, namely the bounds of humans as spiritual beings. And just as maximalism deals with pushing against the thresholds of what the common practice musical code could bear, the transcendental musical mode rubs up against the limits of Being to suggest the supra-temporal, supra-corporeal, and supra-rational. The wonderful thing about a felicitously chosen metaphor, a spot-on musical analysis, or any other successful descriptive strategy for talking about music is its ability to “kindle” new understandings (Lawrence Kramer’s word, not amazon’s). This is true for broad historiographical categories as well. Placing Strauss and Mahler into the same camp makes a lot of intuitive sense; it doesn’t really cut against expectations. But uniting composers as disparate as Scriabin, Ives, Schoenberg, and Messiaen under the “transcendental” label kindles a very new sort of understanding, at least for this reader. It is revealing that both Scriabin and Ives went to their graves with grandly transcendental projects unfinished; the vastness of their ambitions, it seems, was paralyzingly daunting even for these immense talents. In attempting to transcend this ultimate limit through musical sound (and failing), the late-Romantic conceit of Weltanschauungsmusik was punctured. Such a transcendental project was, in the end, circumscribed by its own set of limits, and the “modernism” that began in the 1920s was in some ways an attempt to reimpose, through technical strong-arming, the limits that were breached (or at least threatened) by the Thanatos of Romanticism. In Nietzschian terms, the Dionysian, limit-shattering impulse of maximalism and transcendentalism (itself a form of maximalism), by pointing out the impossibility of such a lofty project, led to an “Apollonian” embrace of limits. In short, I find a lot to admire in the guiding categories of the first half of the volume. Did you find this organizational schema compelling, or better yet, did it kindle a new understanding that usefully augments what you know (or think you know) about early twentieth century music? We eased back into our Challenge this week like an elephant eases into a teacup. This week’s reading covered almost all of Taruskin’s chapter on the early life and work of Arnold Schoenberg, a composer whose opaqueness is famous, and well known in his own day: Schoenberg’s disciple Alban Berg wrote an article called “Why Is Schoenberg’s Music So Difficult to Understand?” in honor of his teacher’s fiftieth birthday (IV, 324). Taruskin’s discussion of Schoenberg’s music includes the opera Erwartung (Op. 17), the art song Mädchenlied (Op. 6, no. 3), Sechs kleine Klavierstücke (“Six Little Pieces for Piano,” Op. 19, no. 1), “Vorgefühle” (“Premonitions”) from Five Orchestral Pieces (op. 16), and the unfinished oratorio Die Jakobsleiter. The analyses, which are written in a style considerate of the reader, are still heady and dense enough to give the undergraduate music student—not to mention the intelligent general reader—pause. Indeed, for many music students, the real question is not Berg’s “why so difficult to understand?” but “why should we try to understand Schoenberg’s music in the first place?” Taruskin offers a compelling answer by linking Schoenberg’s technical developments, the realm of the mind, to his vision of transcendence, the realm of the elevated soul. Rather than being merely a set of mathematical exercises (a common blanket attack leveled at “atonal music” without regard to its accuracy or chronological appropriateness) that negated the spiritual aims of Romanticism, Taruskin argues that Schoenberg was taking transcendence to new extremes (Taruskin uses the term “maximalism”). This chapter is the final piece of Taruskin’s trilogy of transcendentalism (chapters 4-6), in which he sets forth a major rethinking of the traditionally held division between the Romantic and Modernist periods in musical history. One of its major results is to revise the core definition of what comprises Romanticism—namely, that transcendence, rather than harmonic practice, is the Romantic trump card. This runs directly in contrast to traditional understandings of the divisions between Romantic and Modernist periods, which are usually cast in technical terms: extreme chromaticism gave way to “atonality” and the final vestiges of common-practice harmony were eradicated, ushering in the new age. The example of this narrative I happen to have on my nearby shelf at the moment is Robert P. Morgan’s textbook, Twentieth-Century Music. * His analysis of Erwartung forms an apt comparison to Taruskin’s. Whereas a description of the plot is something of an afterthought in Morgan’s, second to Schoenberg’s compositional technique, it comes up front in Taruskin’s, framing the entire discussion. In Morgan’s, Erwartung is the clarion call of something new: “With its vivid suggestion of impending disaster and emotional disintegration, it is a true child of the new age” (73, emphasis added). In Taruskin’s narrative, Erwartung is driving toward a climax of pathos, the last gasp of the historical stream of Romanticism. As Taruskin will go on to argue in chapter 8, the “real” twentieth century didn’t begin at the fin de siècle, but in the 1920s when composers like Stravinsky sought to eradicate not Romantic harmonic practice, but Romantic subjectivity. I, for one, will continue chunking through Taruskin’s text with one of Schoenberg’s (Taruskin’s?) lessons ringing in my ears: transcendence ain’t easy, but it’s worth it. *Robert P. Morgan, Twentieth-Century Music: A History of Musical Style in Modern Europe and America (New York: WW Norton & Company, 1991). After a sleep-deprived academic quarter, Mark and I are skidding into the summer exhausted but pumped to be returning to the TC. It is now official: half of our writing team has a Ph.D.! (But don’t go expecting posts to be that much more trenchant and deep or anything.) Despite projections when we launched the blog, Mark has scaled the doctoral summit in advance of completing the Challenge. Congratulations, fellow traveler! So, it’s back to business. Beginning this week, we’ll be returning to our original weekly posting schedule, and we’ll be continuing with Vol. IV p.300. We’re also going to be returning to the Must-Reads list for some much-needed updates; if you have any suggestions, be sure to let us know. Thank you, readers, for your patience and understanding during our hiatus. It’s good to be back.